Chances are, the first flowers you ever picked were for your Mom. Show her you’ve come a long way since those wilted dandelions with a stunning arrangement of lilacs fresh from your florist. Not only is early May Mother’s Day, it’s also the prime season for these fragrant stems to be in stock in your florist’s cooler or, perhaps, your own backyard. Their sweet scent fills a room like your laughter once did and will remind her that, even though you’re all grown up, you still like picking her posies. While lilacs are known for their soft, lavender color, they come in a variety of different hues now from deep, dark purple to soft pinks and white. The individual flowers are dainty and light, but cluster together forming a dense bloom of soft petals. The fragrance is sweet and heavy, like a sleeping baby, but is easily carried on the breeze from a window opened up for the first warm days of spring. 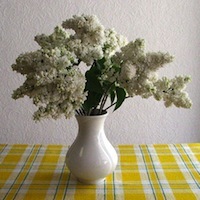 Lilac stems are a perfect length for vase arrangements and look lovely on their own in a white, enamel pitcher or trimmed short in a clear, round vase. 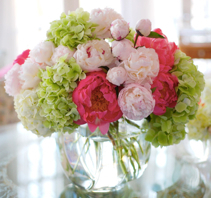 With pastel colors and a delicate texture, they mix well with other spring-blooming stems such as peonies or anemones. Try pairing white lilacs with antique roses for a vintage look or purple ones with calla lilies for an elegant arrangement. Mixed with lisianthus and a few light, yellow stems of ladies’ mantle, these flowers make a fresh-picked bouquet that will remind her of the days you came running to her with a fist full of wilted daises, yet keep her kitchen fresh with fragrance for a week or more. The heart-shaped leaves are a lovely green, but generally wilt long before the blooms will and are best removed after cutting. Native to parts of Europe and Asia, the lilac was brought to America early on by colonists and planted as a deciduous shrub close to houses and parks where its springtime blooms were a sign that the long winter was finally over. With its ability to thrive in a wide range of temperatures and soils, there is hardly a town on the map that does not have a least one lilac in the landscape and its sweet fragrance is sure to bring back many a nostalgic memory. In the language of flowers, the lilac is associated with innocence and first love. Show her she will always be your first love with lovely lilacs on Mother’s Day.